GEORGE E. LUMSDEN (1847-1903) was the first Canadian-born President of the Society. His father was an Anglican minister, and it was from him that he acquired his love of astronomy. 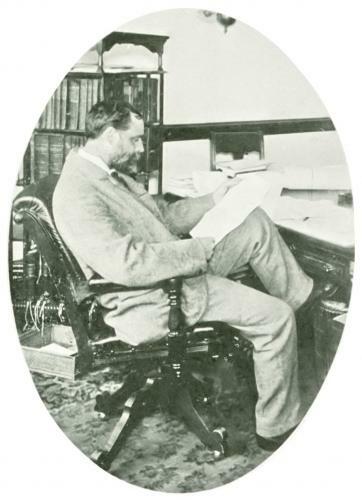 After a career in journalism, George Lumsden entered the Ontario Civil Service in 1880, rising to become Assistant Provincial Secretary, an office comparable to Deputy Minister. In spite of the heavy demands of this position he was devoted to the Astronomical Society, serving as Secretary, Editor and President. He had papers published by the Royal Society of Canada, in Popular Astronomy and in Scientific American. Fifteen of his contributions appear in the Transactions of the Society. A neighbour and friend said, "He was always ready to point out the great stars and constellations and to aid the visitor in using the telescope on his premises. His gentle enthusiasm, as he dwelt on the beauty and magnificence of the firmament induced many to pursue such charming studies." The following tributes are from the RASC 1902-03 Selected Papers and Proceedings. Our last year  was saddened by the loss of one of our members, who was of the original coterie above spoken of, was long our Corresponding Secretary, resigned that place to take, for the now customary term of two years, the President's chair, and all too soon thereafter was removed by a premature decease. Mr. G. E. Lumsden unfortunately left behind him no likeness which adequately represents his features with the habitual expression of bonhomie with which we were familiar. The best is a photograph taken by his daughter, which is reproduced. The Society offered, by an address, its sincere condolence to Mr. Lumsden's family, and in a note to these pages are given the remarks made by the seconder of that address,* which was appropriately moved by Mr. Andrew Elvins, who is looked up to as the father of the Society. REMARKS BY MR. J. C. HAMILTON, M.A., LL.B. * It is difficult to realize that one has gone whom it seemed most desirable to retain as our mentor and guide, who was rightly esteemed for learning, and who wielded a beautiful influence not only in this Society but throughout the land. Well developed thought and accuracy in result marked his course. His life of singular purity and almost austere simplicity was devoted to duty and science. Among Mr. Lumsden's neighbors, of whom for some years I was one, no one was more esteemed, more willing to speak a pleasant word or do a kind act. He was always ready to point out the great stars and constellations, and to aid the visitor in using the telescope on his premises. His gentle enthusiasm, as he dwelt on the beauty and magnificence of the firmament, induced many to pursue such charming studies. When weary after the day's labours, he found recreation in scientific pursuits, the change of mental occupation giving rest. He delighted chiefly in regarding the wonderful surface of the moon, the rings of Saturn, and Jupiter with his belts and revolving satellites. Once, discussing such themes, he told me that his worthy father had the like inclinations, and that when, in his old age, a friend suggested that it seemed strange to find him still intent on nature's problems, the reverend man answered happily; 'I believe that in heaven we will continue the studies begun on earth, and I wish to know all I can before I depart." "Jamque opus exegi . . .
"Completed is my work . . . Borne up beyond the stars."